classification a breccia is a clastic sedimentary rock composed of angular clasts in a cementing matrix. The rounded clasts encountered in the Bunte breccia seem to contradict this definition, the case, however, is to be comprehended as follows: Upon impact in the area of the today’s Tüttensee, a conglomeratic rock composed of Alpine lithologies was shattered whereby components of the fragmentation could survive as rounded cobbles to become incorporated in the breccia. Correspondingly, well-rounded clasts can be found within the Bunte breccia ejecta of the Nördlinger Ries impact structure (e.g., the so-called Buchberg cobbles). Image 1. Chiemgau impact ejecta: Strong corrosion of a limestone boulder. The here presented cobbles and boulders from the Tüttensee Bunte breccia stand out to have still more experienced. We explain the deep-reaching corrosion and rock dissolution right up to skeletal formation by the action of high temperatures or/and the action of strong acid dissolution. The voluminous boulder in Image 1 is a limestone that because of its peculiar sculpture can impossibly have come from the Alps as is (note, e.g., the roughly central fine pin). 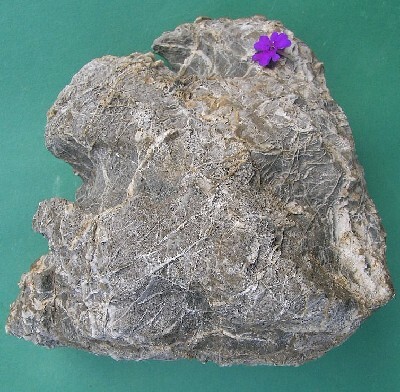 Obviously, a noticeable part of the rock has been removed, and that did not happen by fracture. Instead, we suggest high temperatures in the impact process being able to melt a limestone or, like in lime works, to decarbonize it. We also consider a dissolution by nitric acid that may be produced in the impact explosion cloud, as previously discussed here on our website. Both processes heat and acid need not be mutually exclusive. Image 2. Chiemgau-impact ejecta: strong corrosion of a sandstone cobble. 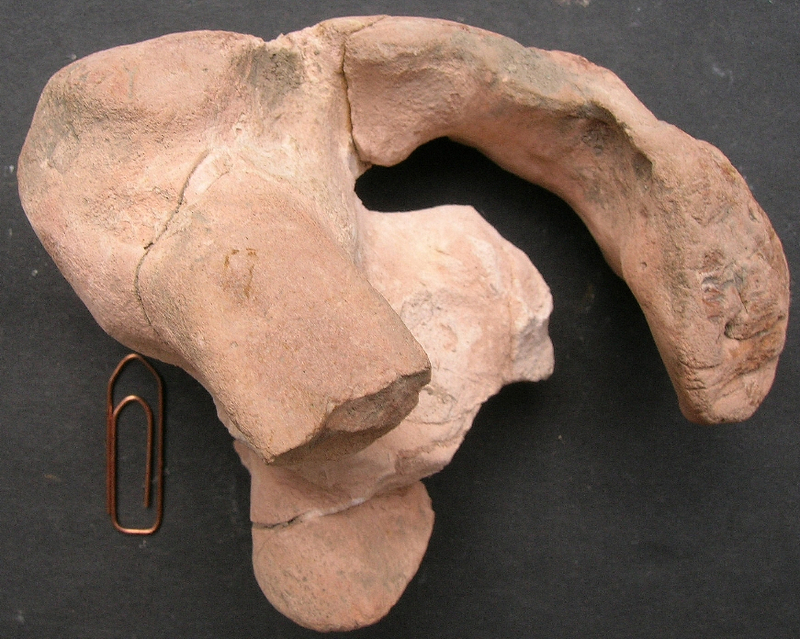 Image 2 shows a sandstone component from the Bunte breccia already, joking, called a saurian embryo. For the formation of this “sculpture” we can refer to the same processes of destruction. If the quartz grains of the sandstone are carbonate-cemented then on action of temperature and/or acid a deep-reaching corrosion starts. On decreasing temperature and acidity rock skeletons as shown may remain. Image 3. 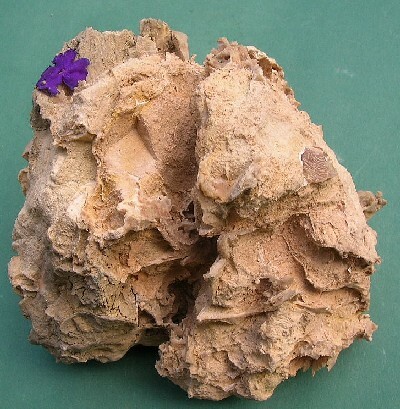 Chiemgau impact ejecta – strongly corroded limestone/dolostone from the Tüttensee excavation. Image 4. Corroded limestone boulder from the Tüttensee ejecta. We would like to once more point out that the drastic rock modifications shown here are observed with clasts that are constituent part of a rock, namely the Bunte breccia. Recently, geologists of the Bavarian Geological Survey (now Landesamt für Umwelt) have explained the deep-reaching skeletal corrosion of clasts from the impact layer by sour soils, which we don’t want to comment any further. The clast shown in Image 5 also originates from the Tüttensee impact layer. It was encountered at some 1.5 m depth at the base of the Bunte breccia pushed-in in the fossil soil horizon underneath. The boulder is a hard, dense quartzite and exhibits distinct abrasions all around. 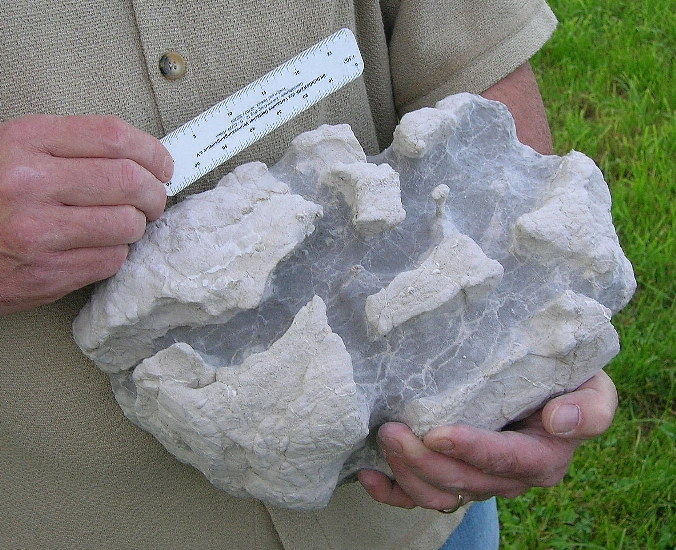 Not any striations can be observed on the surface of the rock, and the imprints cannot possibly have originated from glacial abrasion – in order to preclude respective objections by deniers of the Chiemgau impact. The directional imprints are smooth suggesting a plastic, if only short, behavior (like a pulp) of the quartzite material. Within the frame of our model that defines the Bunte breccia to be ejecta from the Tüttensee crater, the boulder underwent the excavation of the growing crater initiated by extreme shock pressures following the impact into the target of Alpine material. 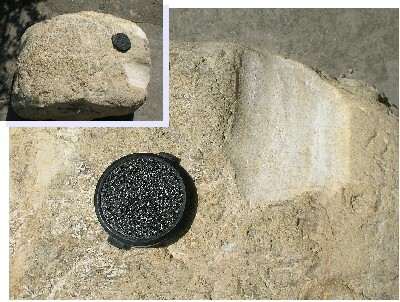 During this high-pressure phase, the boulder became plastically deformed by neighboring clasts was ejected and landed on the (at present fossil) soil at the base of the developing Bunte breccia ejecta horizon.